Donation of $10.00 from Noel Morris to help towards rebuilding the dormitory. 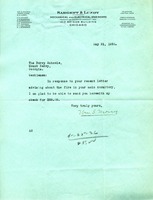 Donation of $50.00 from Mary Nevins to help towards rebuilding the dormitory. Mary Nevins says she has been so busy at the farm that the 16th has come before she knows it. She sends $100 explaining that since she gave a gift to help rebuild the dormitory she can't give more at this time. Donation of $25.00 towards rebuilding the dormitory. Donation of $75.00 towards rebuilding the lost dormitory. 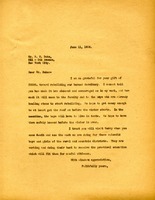 Donation of $25.00 from William S. Monroe towards rebuilding the dormitory. 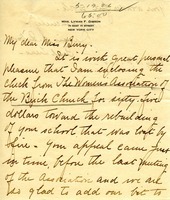 Alice MIlliken writes to Martha Berry explaining why her academy will not be able to donate money to the schools. 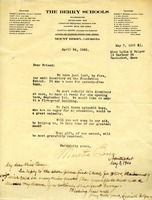 Martha Berry thanks Mr. Duke for his contribution of $2000 towards the rebuilding of the burned dormitory. In this letter Anna Bague asks Martha Berry to send her a copy of the Southern Highlander issue that contained a foreword about The Berry School's 25th anniversary. 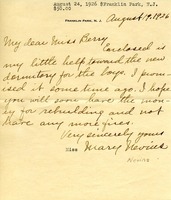 Frank Le G. Gilliss sends ten dollars towards the rebuilding of the dormitory destroyed in the fire. 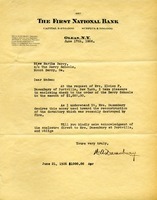 Martha Berry thanks Miss. 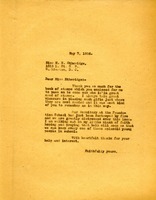 Etheridge for the book of stamps donated to the school. Mrs. Gibson sends a $65 check on behalf of the Women's Association of the Brick Church to be used towards the rebuilding of the burned dormitory. 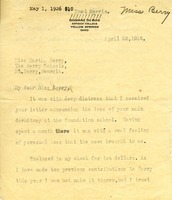 Mr. Dusenbury sends $1000 to be used to rebuild the burned down dormitory at the request of Mrs. Eloise F. Dusenbury. 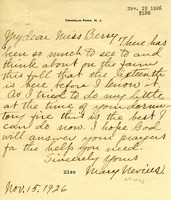 Miss Folger responds to Miss Berry's plea with a small donation and her best wishes. 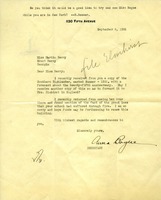 A letter from Elizabeth Ely, secretary to Mrs. Stanley G. Flagg, stating Mrs. Flagg's regret to hear of the fire and that a cheque is enclosed for the re-building fund.